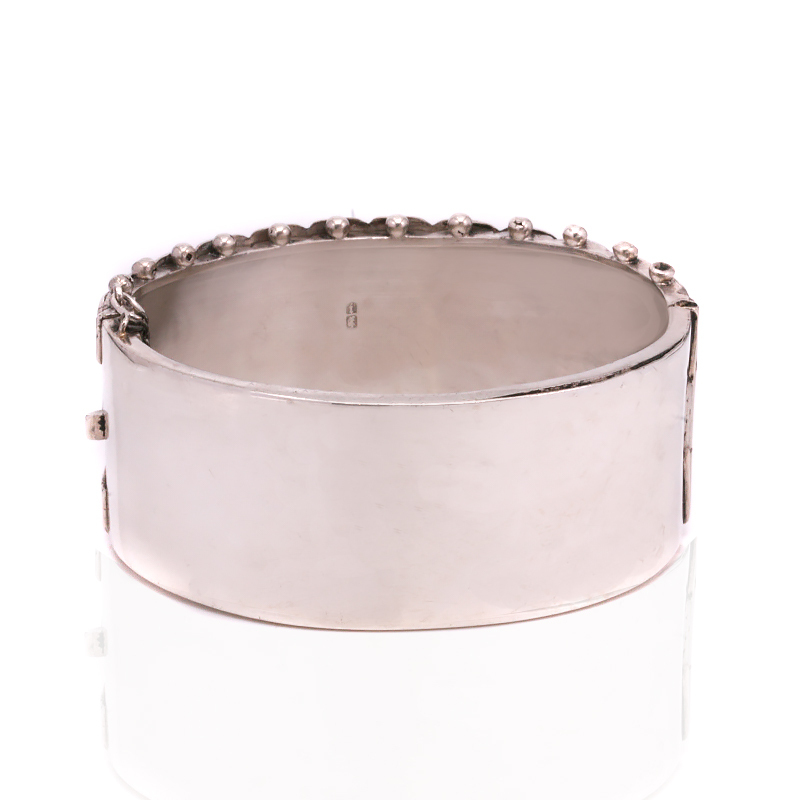 Product code: ES8166 Categories: Antique, Antique Bangle. There is something so impressive about a lovely wide antique bangle on your wrist, and here is a very beautiful sterling silver, rose and green gold antique bangle made in 1885. Measuring 28.1mm wide at the front section and 25.3mm wide at the back, the front not only has beautiful hand engraving but this is highlighted in both rose and green gold. Whereas rose gold is still found today, green gold was only used for such a brief time in the late Victorian era and has a lovely light soft green hue to it, it emphasises the leaves in the bangle. It is wonderful features such as this that makes this bangle even more special and beautiful and sure to always be admired every time that it is worn. With the combination of colours, this will be so comfortable and practical to wear all the time and it is also fitted with a safety chain for added security. A wonderful example of a bangle from the Victorian era that is over 130 years ago and still so beautiful. This antique cuff bangle was made in the Victorian era in 1885. Made in sterling silver and highlighted with rose gold and green gold, it is such an attractive and unique antique bangle that is perfect for any occasion.